The ICE spacecraft (see below) has recently approached Earth close enough to be detectable at the Allen Telescope Array (ATA). We have successfully detected the ICE spacecraft carrier signal using the SonATA (SETI on the ATA) signal detection equipment and will share the details here. The technical community has been all abuzz about the return of the ICE spacecraft, formerly named the International Earth-Sun Explorer-3 (ISEE-3). It was launched in 1978 to study Earth’s magnetosphere and its interaction with the solar wind. The ICE spacecraft has been far away and out of contact for a long time and it is now quickly approaching earth once again. NASA has said it no longer has the equipment to communicate with the spacecraft. Radio enthusiasts around the world are trying to figure out a way to contact it and tell it to start dumping any data it may have gathered. The Bochum Observatory in Germany has been able to detect the ICE spacecraft with their 20 meter dish. Others are sure to follow. The Center for SETI Research at The SETI Institute operates a SETI signal detection program using the Allen Telescope Array located at the Hat Creek Radio Observatory, near Lassen Volcanic National Park in Northern California. For 12 hours every day, various stars, and now exoplanets discovered by the Kepler Mission and groundbased telescopes, are observed in an effort to detect any radio signal between 1 GHz and 10 GHz that may be from an extraterrestrial technological civilization. On a regular basis we validate our system by pointing the 42 dishes of our telescope towards a known spacecraft to test if the system automatically detects a signal. If the signal is detected then we know the system is functioning properly. We like to observe a spacecraft that has weak signals and we commonly use Voyager1 which is very weak. Recently we have added the ICE spacecraft to the list of spacecraft we observe. On March 10, 2014 we pointed towards the ICE spacecraft, tuned to its carrier signal frequency of 2217.5 MHz, and let the system do its thing. The ICE spacecraft signal was immediately detected. It was very weak, but strong enough for our SETI detector to recognize easily. The system creates these images called “waterfall” plots with time on the y axis, frequency on the x axis. This representation allows us to readily see signals as lines or other shapes depending on the characteristics of the signal. You can see the ICE spacecraft signal as a fuzzy line, easier to see if you squint. The fuzziness may be evidence of oscillator degradation or of possible data transmission. The displacement away from 2217.5 MHz is the result of a Doppler shift due to the motion of the spacecraft relative to the array. The slope of the detected signal is a ‘Doppler drift’ due to relative acceleration between the spacecraft and Earth, as our planet rotates. We will be using the detection of the ICE spacecraft as a system test for at least the next year, or until it becomes too weak for us to detect. 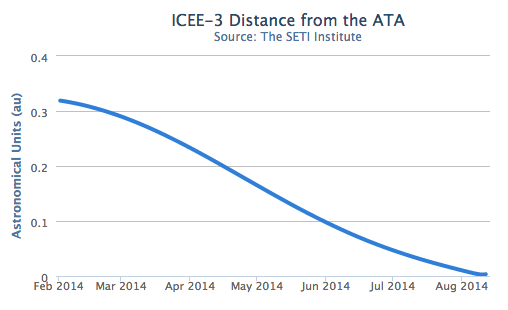 The ICE spacecraft is now just over 0.3 AU from Earth (about 45 million km). It is approaching Earth and will be closest on August 09, 2014. At closest approach the signal should be 10,000 times stronger than it is now. Here is an zoom-in of the closest approach, this time with distance in km. The ICE spacecraft detected by the The Bochum Observatory in Germany.